Thank you for your interest in the Idaho Center for Regenerative Medicine. 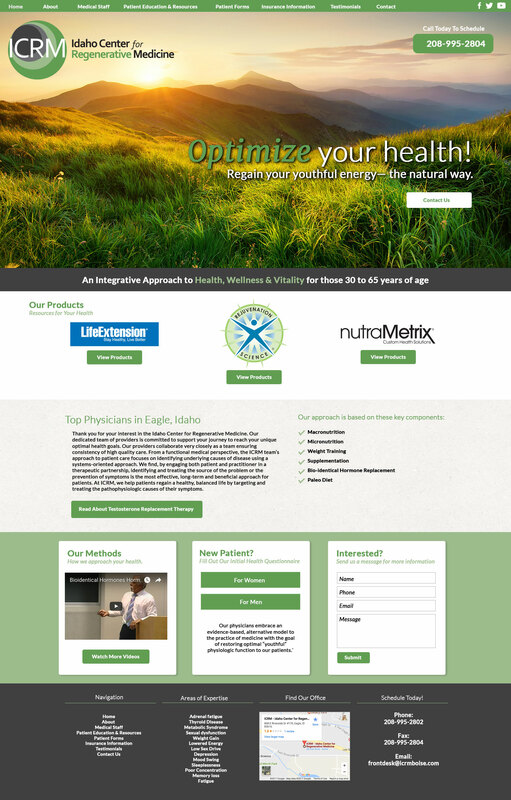 Our dedicated team of providers is committed to support your journey to reach your unique optimal health goals. Our providers collaborate very closely as a team ensuring consistency of high quality care. From a functional medical perspective, the ICRM team’s approach to patient care focuses on identifying underlying causes of disease using a systems-oriented approach. We find, by engaging both patient and practitioner in a therapeutic partnership, identifying and treating the source of the problem or the prevention of symptoms is the most effective, long-term and beneficial approach for patients. At ICRM, we help patients regain a healthy, balanced life by targeting and treating the pathophysiologic causes of their symptoms.